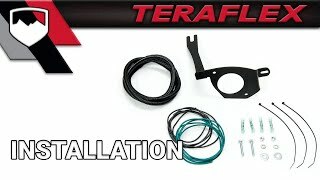 Some aftermarket front bumpers and/or winches for 2012-2018 JK Wrangler and JKU Unlimited models with the 3.6-liter Pentastar V-6 require the vacuum pump to be relocated from the front crossmember to inside of the engine bay. Our simple JK/JKU Vacuum Pump Relocation Bracket Kit moves the vacuum pump safely and securely into the engine bay. • Some vacuum tube re-routing is required. Vacuum pump relocation bracket was very easy to install, the only thing that wasn't mentioned in the instructions was in my Jeep (2015 Wrangler Unlimited) there were two horn units in the engine bay and one was right where this pump goes so I had to remove it to install this bracket. Have not found a place to install the second horn back in but right now does not seem like it is really needed so I am not sure if the second horn is just for loudness purposes as the horn, and chimes for arming the alarm still function.